Located in Tyler, Texas, we provide real-time weather conditions, forecasts, and radar images along with additional beneficial information and resources regarding our local weather and climate. 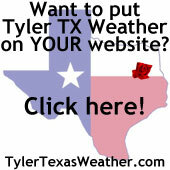 We also display several views of our East Texas weather via our live streaming webcams. Please let us know you stopped by and leave your comments about the site by clicking here.